Why are there so many cannabinoids? Chances are you will have heard of THC, as well as our favourite cannabinoid, CBD. Both are versatile, naturally occurring chemicals that are being extensively researched for their medicinal benefit. The cannabis plant, however, is more than just two cannabinoids. Over a hundred chemical compounds exist, and that's just the ones we have managed to isolate. Despite being a melting pot of different compounds, not all the cannabinoids exist at the same time, or in equal measure. The cannabinoids contained within a young cannabis seedling will be vastly different from those in a plant that is ready to be harvested. Heat, enzymes, or exposure to the atmosphere cause the compounds to react, creating variations in their chemical structure. A prime example would be CBD. Before heat is applied to CBD, it starts life in its raw form—CBDA. This transformation forms the key principle of biosynthesis pathways. Biosynthesis pathways are merely the links between a family tree of all the chemical compounds that are contained within cannabis. At the root of the tree, you have a start point, or in this case your base chemical. From there, branches split and develop into variations of the same original chemical compound. 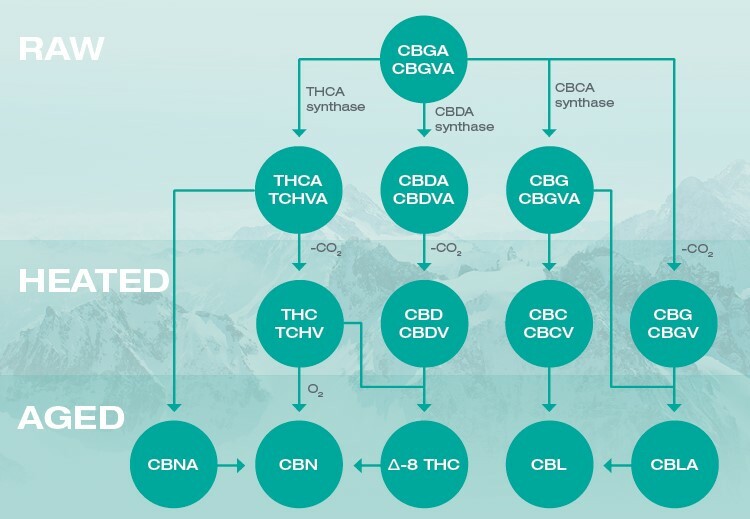 The picture below shows that in cannabis, CBGA is the beginning point. As the branches change, we eventually get to three main cannabinoids, THC, CBD, and CBC. Cannabinoids start life in their olivetolic acid form, like the CBDA we mentioned earlier. When you apply heat to cannabinoids, the “A” (CO₂ molecule) is removed. They become stable and more concentrated. There is, however, another type of acid structure for cannabinoids. If the cannabinoid molecules bind with divarinolic acid, they instead become CBDVA. Once heat is applied, both kinds, CBDA and CBDVA, lose their CO₂ molecule in the same way. With slight changes affecting the chemical structure, it is easy to see how so many cannabinoids can exist. The same concept can be applied to any plant, as they all have biosynthesis pathways. It is, however, the interaction between cannabinoids and our endocannabinoid system that makes cannabis such a fascinating organism. We already know that CBD is extensively studied for its therapeutic benefit, but what does that mean for the remaining cannabinoids in cannabis? The most logical place to start would be with the root of our cannabinoid family tree. CBGA is where all cannabinoids originate. CBG is very similar to its offspring cannabinoid, CBD. The primary reason is that both are non-psychoactive. Because CBG does not induce a high when consumed by humans, it makes a fantastic candidate for medical research purposes. However, the reason CBD has taken precedence over CBG is because of CBG’s incredibly low concentration in mature cannabis and hemp plants. Remember that by the time we come to harvest hemp, the chemical structure has changed dramatically. The low percentage of CBG is also why we are only just starting to uncover its potential. The good news is, scientific studies are growing in number. CBG has been linked to potentially stimulating appetite, reducing inflammation of the digestive system, and relieving pain and anxiety, to name but a few accolades. That being said, the outcomes of early CBG research are hardly surprising. As a parent of several therapeutic cannabinoids, they must get their beneficial attributes from somewhere. There are three main branches of biosynthesis pathways in cannabis. They are the result of specific enzymes interacting with the CBGA cannabinoid as the plant grows. CBD and THC have become familiar names; however, CBC is lesser-known. Let’s start with the essential characteristics of THC and CBD before we explore what makes CBC unique. THC, or tetrahydrocannabinol, is the key psychoactive compound found in the cannabis plant. It mainly binds to CB1 receptors in areas of the brain linked to mood and appetite. It is also the reason that the cannabis plant is predominantly illegal across the world. Thankfully, the question of legality is being challenged, and this is excellent news for the next most common cannabinoid, CBD. Easy access to cannabis plants allows a greater depth of research and further exploration of the therapeutic benefits of cannabidiol (CBD). CBD is non-psychoactive, and is being extensively researched for its medicinal benefit. First isolated in the 1940s, our understanding of this versatile cannabinoid has come a long way. Through preliminary trials, it has been suggested as a viable treatment option for a whole host of detrimental conditions. CBC is also non-psychoactive, but differs slightly from CBD and THC. It does not bind with CB1 and CB2 receptors like its siblings. Instead, CBC shows an affinity for TRPA1 receptors. Research into cannabichromene (CBC) is still very new, but the purpose of these studies is to establish whether CBC has any pharmacological properties. Allow cannabinoids to age for long enough, and they change yet again. This time, the three main branches become cannabinolic acid (CBNA), cannabinol (CBN), and cannabicyclol (CBL). The latter CBL forms when CBC is exposed to light, while CBN is the result of oxidation of THC molecules. CBNA is very similar, but is the result of exposure to the atmosphere while THC still has its acid structure (THCA).